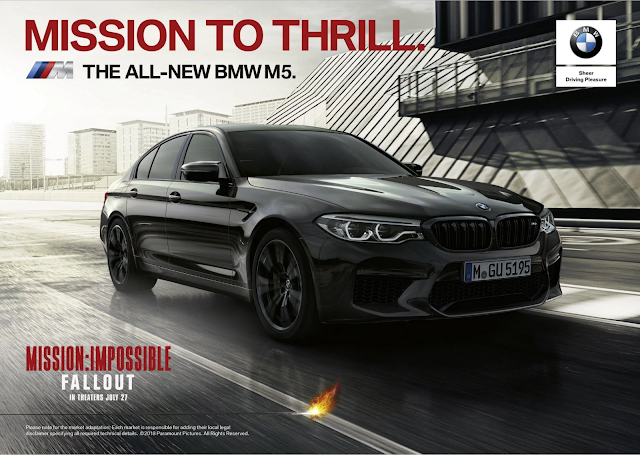 The BMW Group announces its role as the exclusive worldwide automotive partner of the next installment of Paramount Pictures’ and Skydance Media’s legendary action film franchise, “Mission: Impossible – Fallout,” opening in cinemas around the world from 27 July. BMW has been a partner of the iconic film series since 2011, and in the upcoming film, BMW once again provides a range of vehicles and global marketing in support of the release. The new movie finds Ethan Hunt (Tom Cruise) and his IMF team (Alec Baldwin, Simon Pegg, Ving Rhames) along with some familiar allies (Rebecca Ferguson, Michelle Monaghan) in a race against time after a mission gone wrong. Henry Cavill, Angela Bassett, and Vanessa Kirby also join the dynamic cast with filmmaker Christopher McQuarrie returning to the direct. The team of agents is reinforced by the new BMW M5 and a number of other BMW models, including the 1986 BMW 5 Series Sedan, the BMW 7 Series Sedan and the BMW R nineT Scrambler. Styled with characteristic BMW M Performance Parts, such as a black kidney grille and carbon-fibre mirror caps, the BMW M5 makes an impressive appearance in the film. With its powerful 4.4-litre V8 biturbo engine with TwinPower Turbo technology and 441 kW/600 hp (combined fuel consumption: 10.5 l/100 km; combined CO2 emissions: 241 g/km) and the newly-developed high-performance M xDrive all-wheel drive, the BMW M5 makes sure that Cruise’s Ethan Hunt always has the best-possible traction and superior driving dynamics to keep him ahead of his enemies. The BMW R nineT Scrambler can be seen in key scenes, performing daring manoeuvres at rapid speed in a wild chase through Paris. A 1986 BMW 5 Series Sedan, from BMW’s historic past, also makes a major appearance in a high-octane scene which sets a new standard for the action-film genre. The trailer released by Paramount Pictures provides a taste of what is to come. As part of the collaboration with Paramount Pictures, BMW’s global “Mission to Thrill” themed marketing campaign will promote and support the theatrical release and include cobranded broadcast TV media highlighting a range of different vehicles, print ads, digital across BMW sites as well as other key channels, in dealer activations and more. The “Mission Impossible” partnership between BMW and Paramount Pictures, which dates from 2011, has already provided movie fans with several classic moments of cinematic history. The BMW brand has been meaningfully integrated into the stories of each film, showcasing forward thinking technologies and vision that have helped the IMF agents successfully complete their missions. The BMW i Vision Dynamics concept vehicle, which previewed the revolutionary BMW i8 hybrid sports car and technologies like Head-Up Display and active Pedestrian Detection, made its debut in “Mission: Impossible - Ghost Protocol” in 2011. In 2015, this was followed by “Mission: Impossible – Rogue Nation,” in which the BMW M3 pulled off one of the most spectacular backwards-driving stunts in film history. The movie car once again provided a glimpse of future technology with the handprint unlock function, while motorcycle enthusiasts will fondly remember the high-speed chase in which Ethan Hunt rides the BMW Motorrad S 1000 RR through the mountains outside Marrakech. “Mission: Impossible - Fallout” promises to be the most thrilling mission yet.